Photographs, negatives, reports and research notes on UK wind and watermills. Photographs and research material on sugar mills in the Caribbean by David Nicholls and Cyril McCoombe. Micro tapes of conversations with mill workers in Barbados. Photocopies of articles and publications relating to Morgan Lewis Windmill, Barbados; Annaberg Sugar Mill, St John, Virgin Islands; and mills on St Thomas, Jamaica. Script and research notes relating to Niall's SPAB Mill Section Meeting talk on 17 March 1990. Note the extremely long tail pole for turning the cap and sails into the wind. Cutting taken from Times Magazine witht he caption "The Regency house owned by Sam Lord, one of the crullest slave owners on the island". "Old Mill, Barbados, West Indies. Published by Sunshine Ltd., Barbados, West Indies". 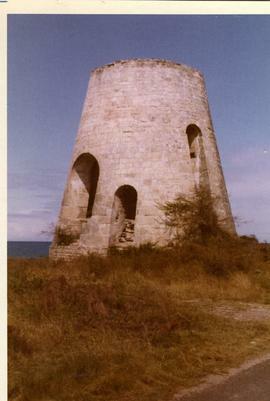 (Photograph used as an illustration in "Some Caribbean Sugar Mills", TIMS 8, 1993). Number DC29. Printed in Barbados by Letchworth Press Limited. Photo by Alric Gaskin. Scotland, Barbados, from the overlooking hills. 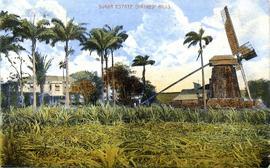 Old sugar mill, Barbados.Published by Wayfarer Bookstore Ltd.